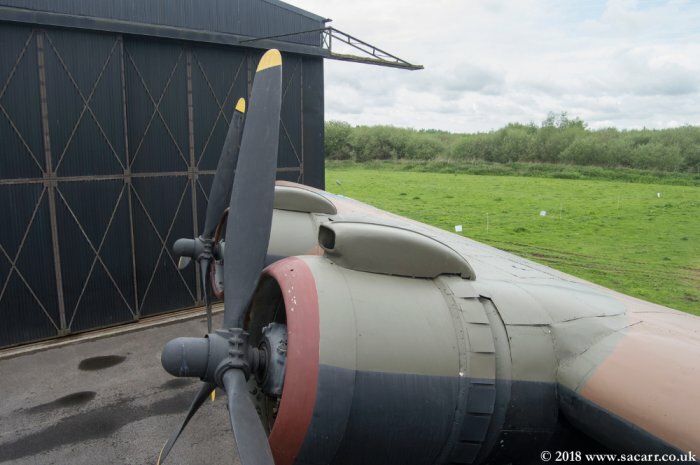 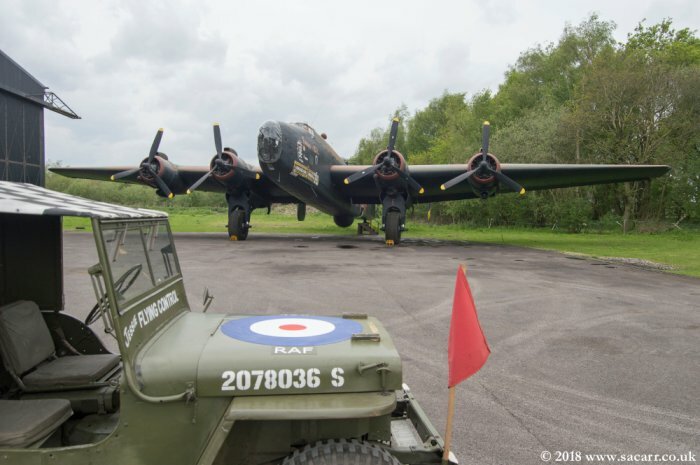 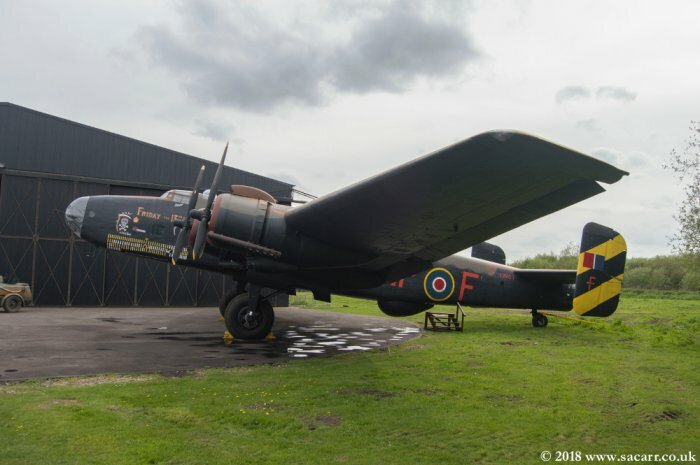 While wandering around on Sunday morning, by chance, I happened to be at the right place at the right time to be invited for a look around the inside of the Yorkshire Air Museum Halifax. 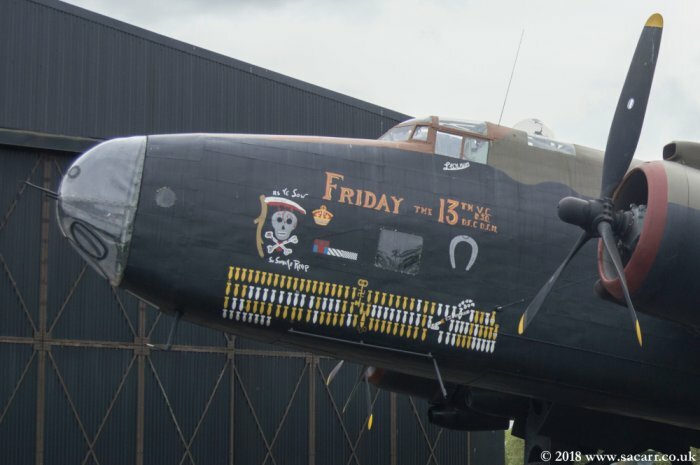 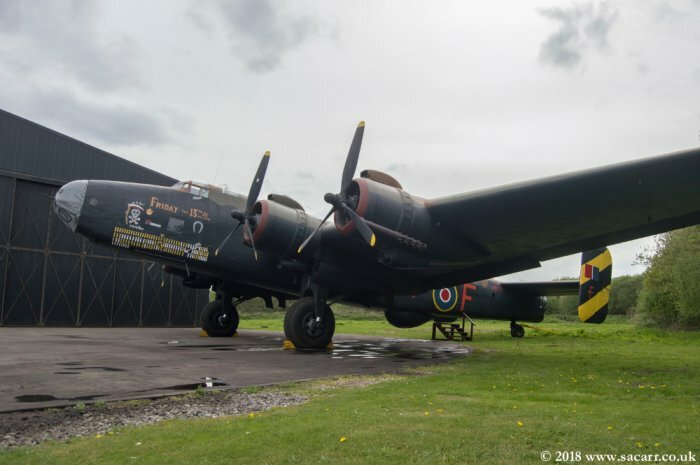 The aircraft is a recreation, based on an original Halifax fuselage with a Hastings wing, and is known as "Friday 13th". 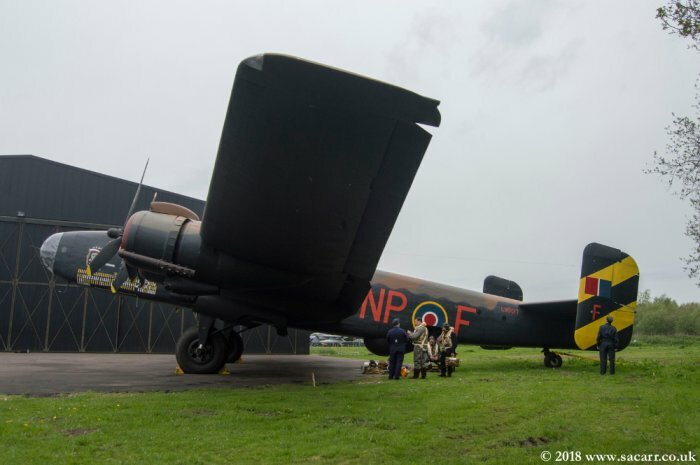 The Hastings was a transport aircraft developed from the Halifax. 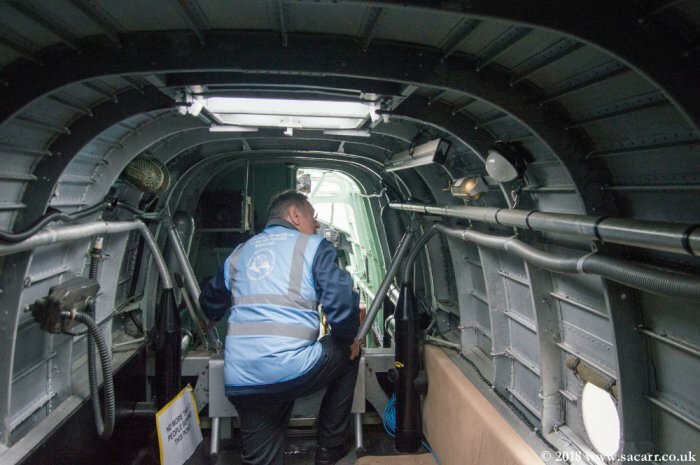 Entering the aircraft through the rear fuselage crew door. 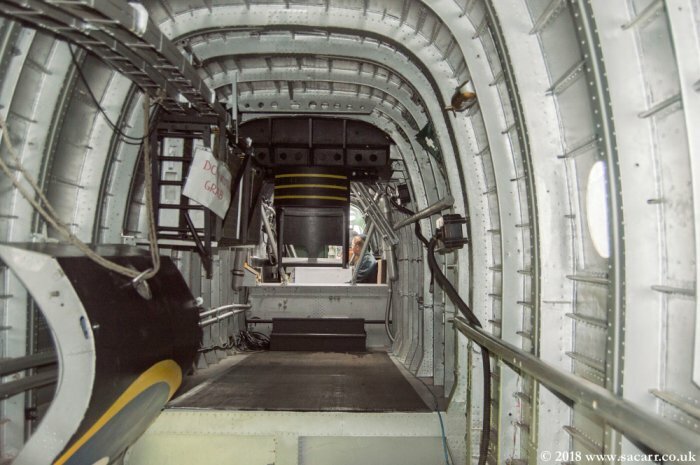 Once in, the curved door can be seen on the right, looking towards the tail gunners area. 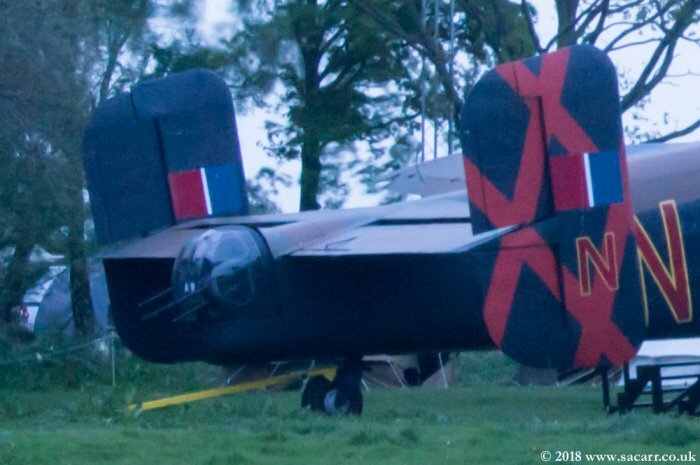 The tail turret from outside. 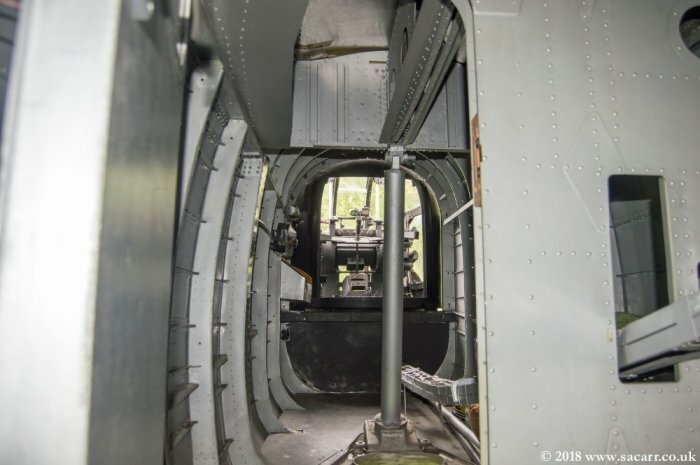 Just into the tail gunner's area is the tail wheel leg and the gunner's turret behind. 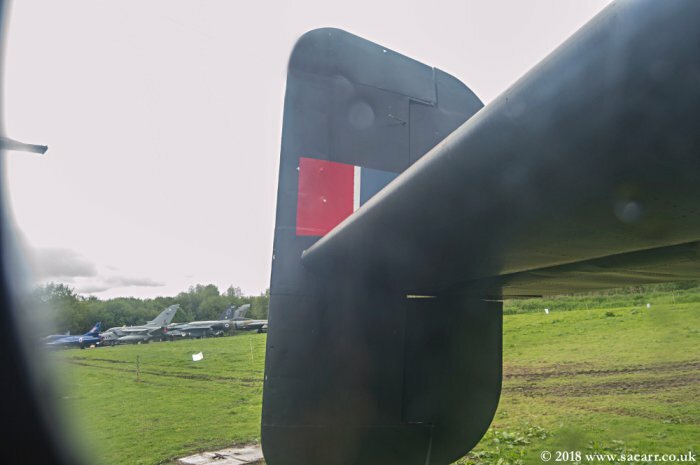 The tail turret from the rear. 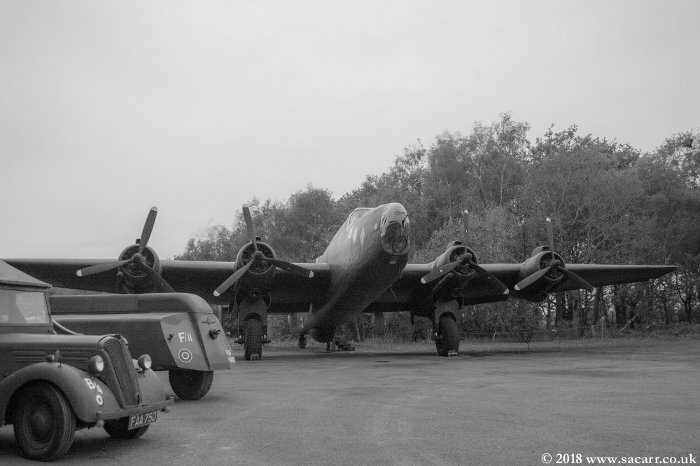 Moving back into the rear fuselage, two tracks carry ammunition for the turret from their storage boxes ahead of the door. 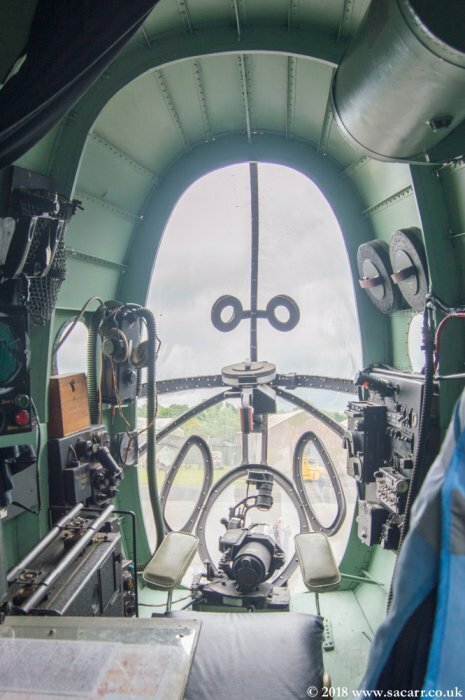 Looking out of the small porthole windows in the rear fuselage. 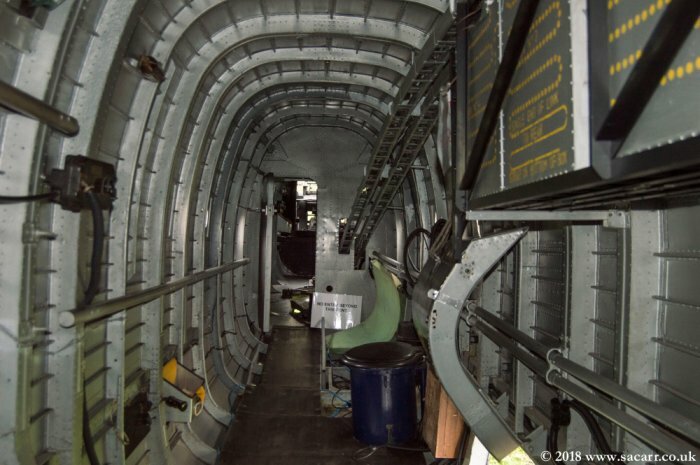 Standing next to the crew door, these are the tail turret ammunition boxes, looking forwards to the mid-upper gunner's turret. 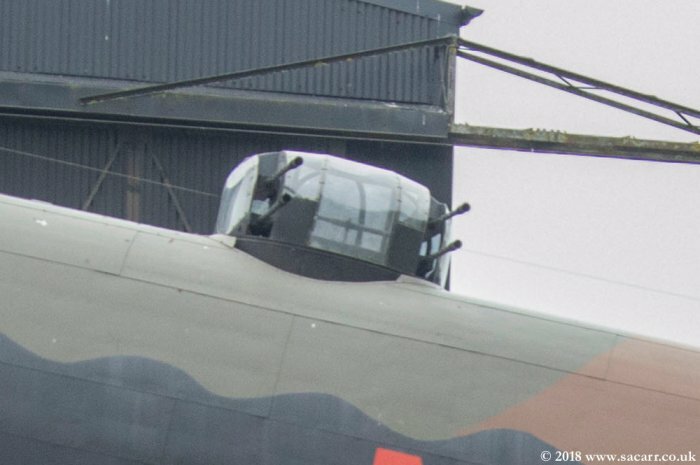 The crew door can be seen on the left, looking forwards to the mid-upper turret and cockpit. 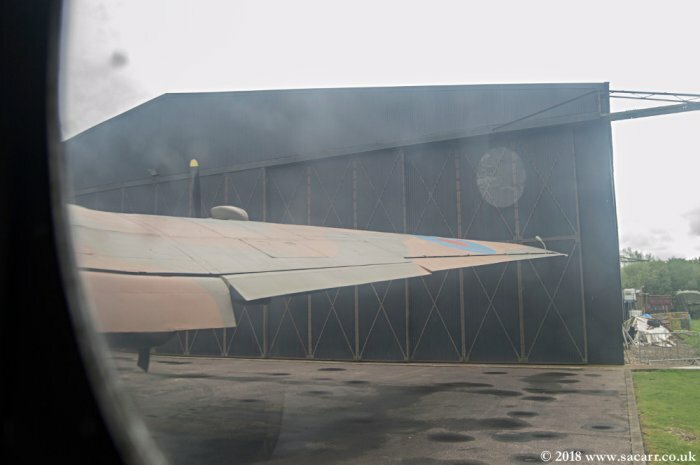 Looking out of the rear fuselage, forwards to the port wing. 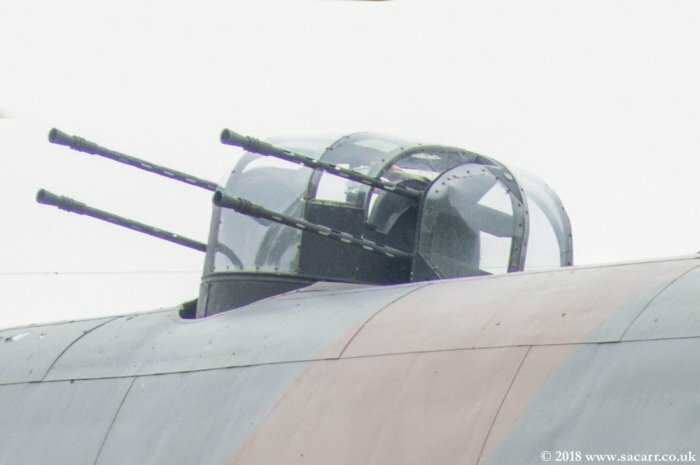 The mid-upper turret frame and daylight from the cockpit ahead. 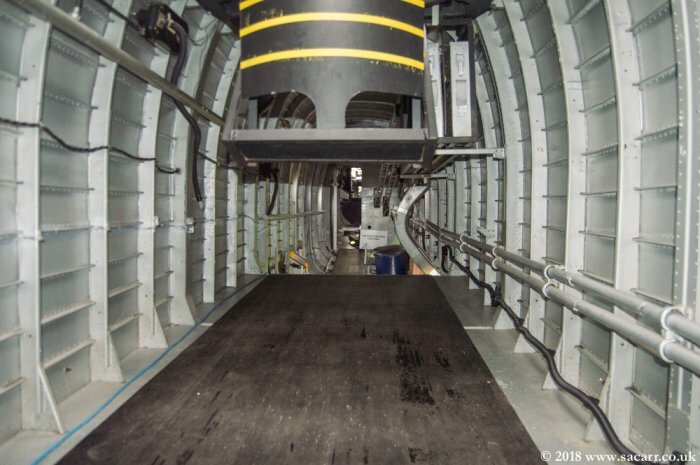 Here's the mid-upper turret, viewed from the port side of the aircraft. 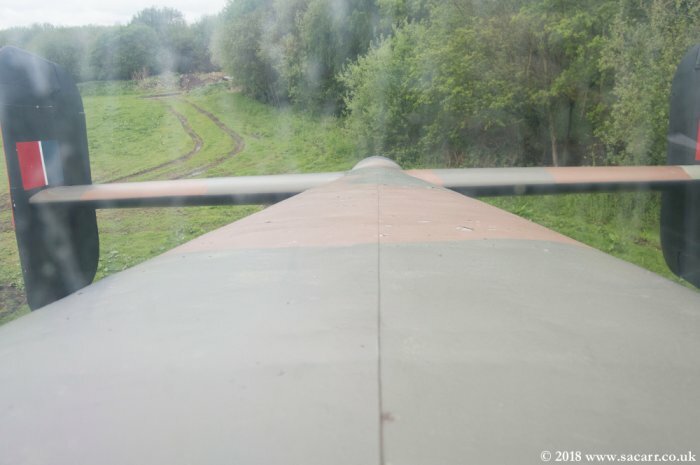 Looking out of the mid-upper turret towards the tail. 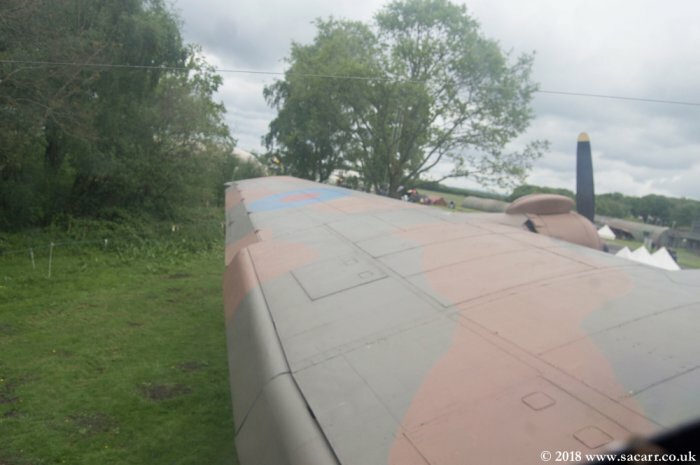 Here's the mid-upper turret again, viewed from the rear port quarter of the aircraft. 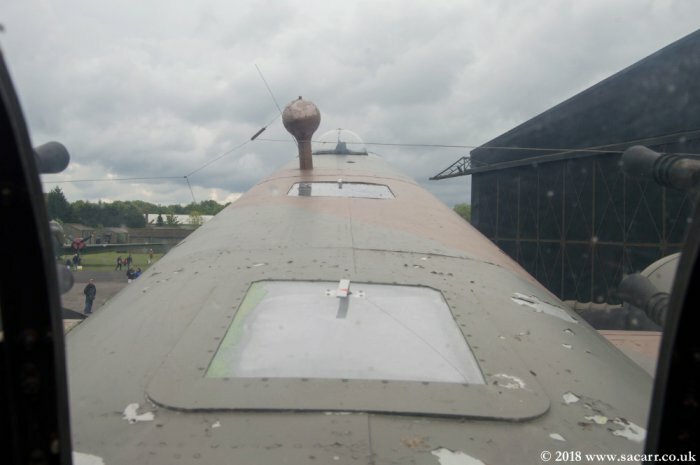 Looking out of the mid-upper turret over the port wing. 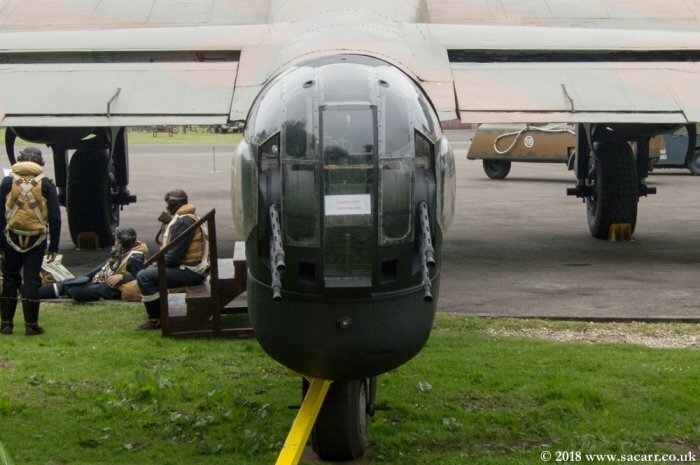 Looking out of the mid-upper turret forwards towards the cockpit. 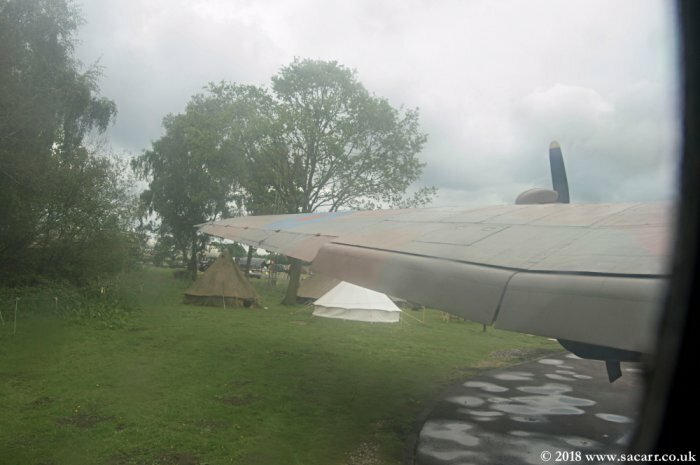 Back in the fuselage, looking out of the rear fuselage, forwards to the starboard wing. 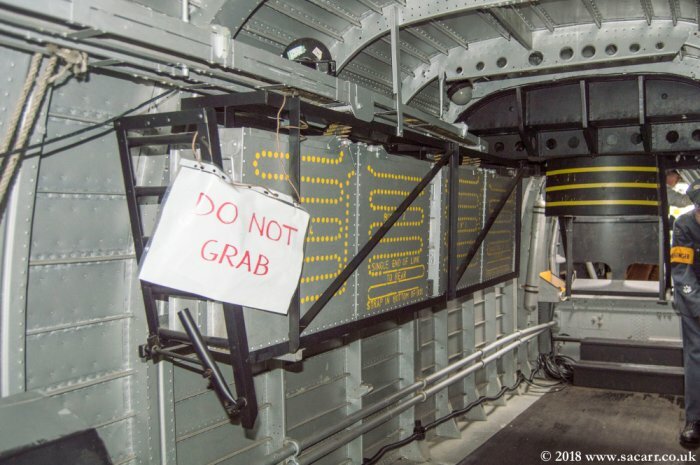 Crawling forwards over the bomb bay towards the cockpit. 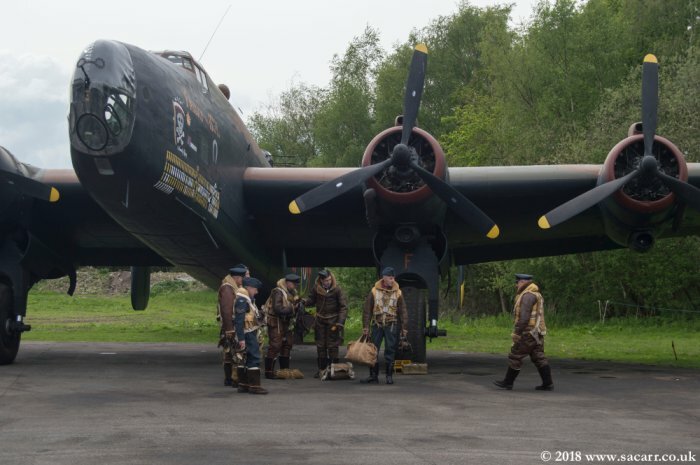 The bomb aimer, navigator, radio operator, pilot and flight engineer where all in this section. 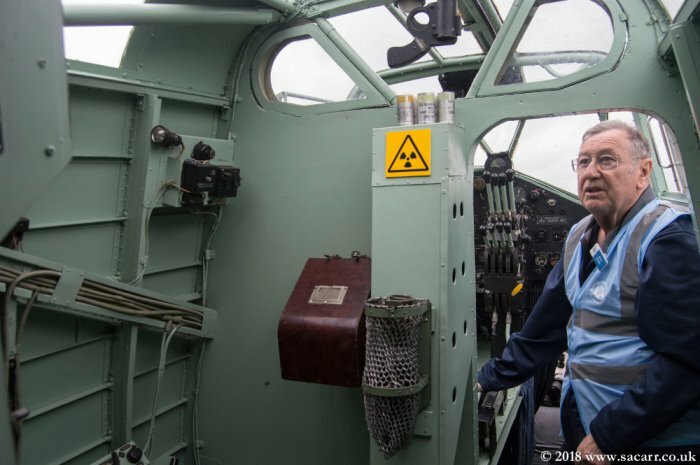 Into the flight engineer's compartment, standing just behind the pilot. 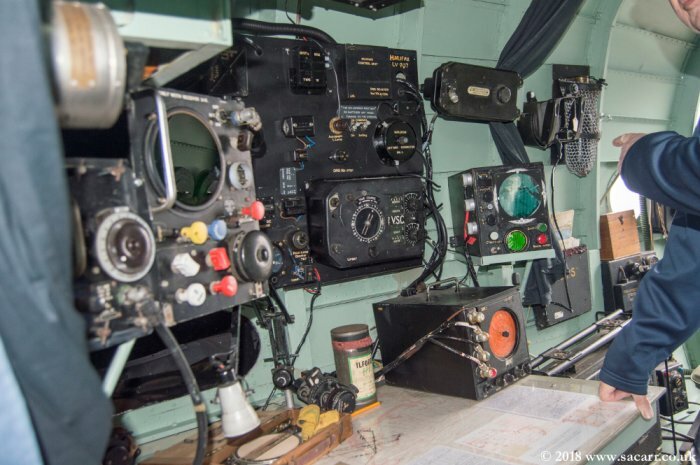 The flight engineer's instruments, standing just behind the pilot. 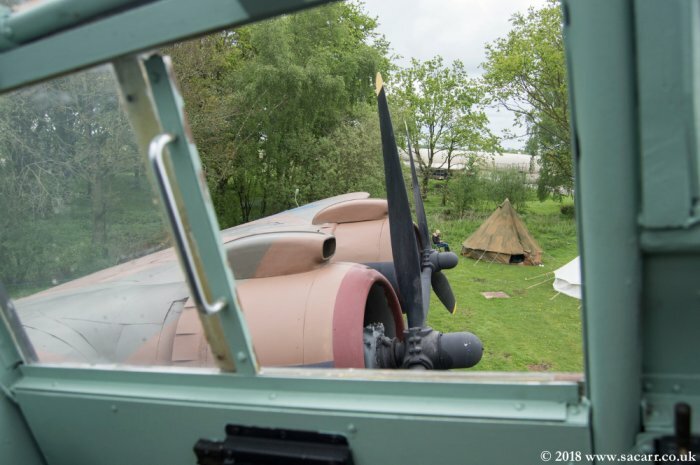 The pilot's view out over the port wing and engines. 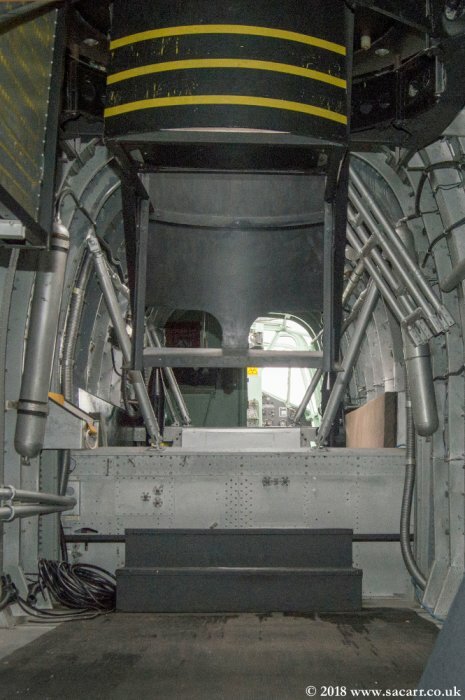 The cockpit and passageway down to the nose. 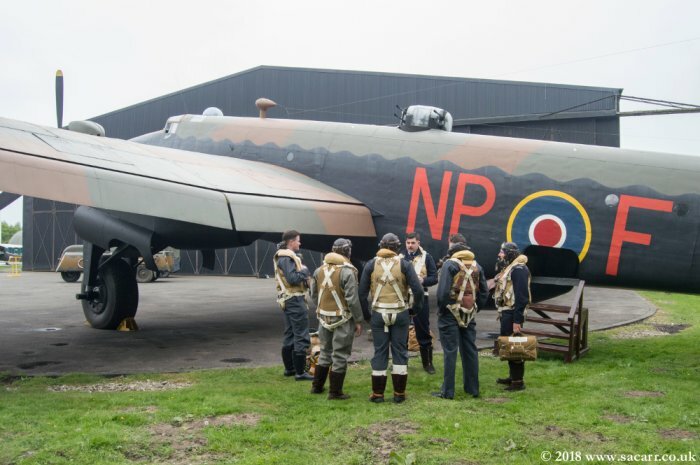 Under the pilot is the radio operator. 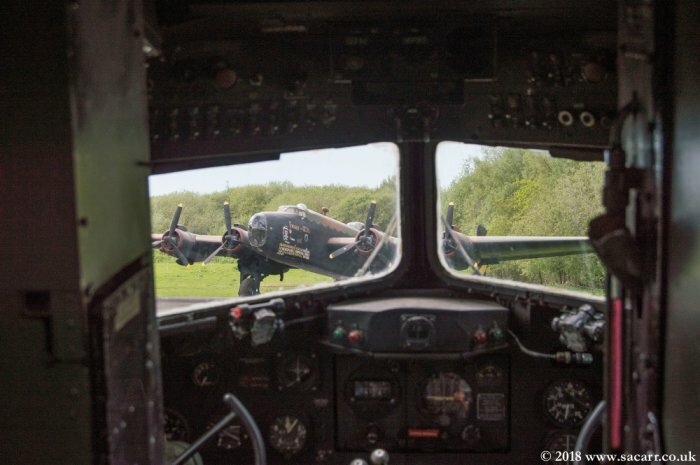 The pilot's view starboard over the engines. 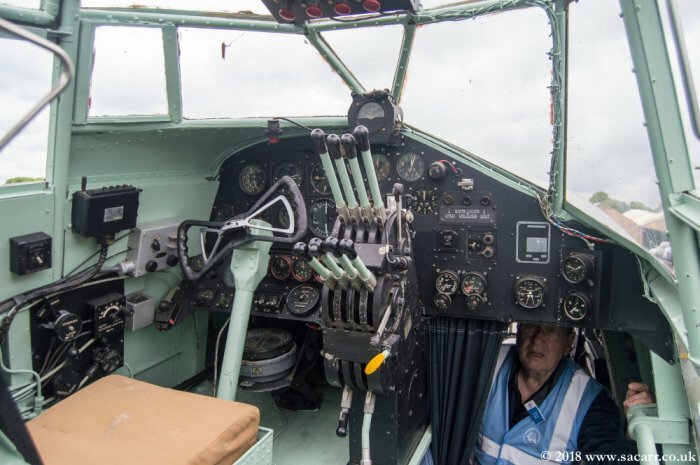 The navigator's plotting table and instruments in the nose. 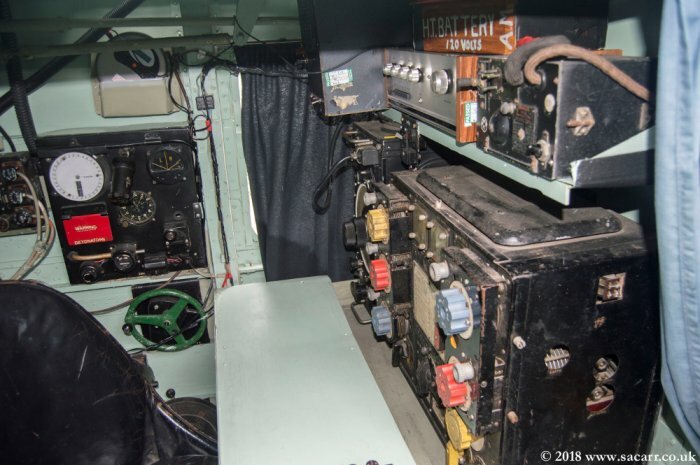 The bomb aimer's compartment. 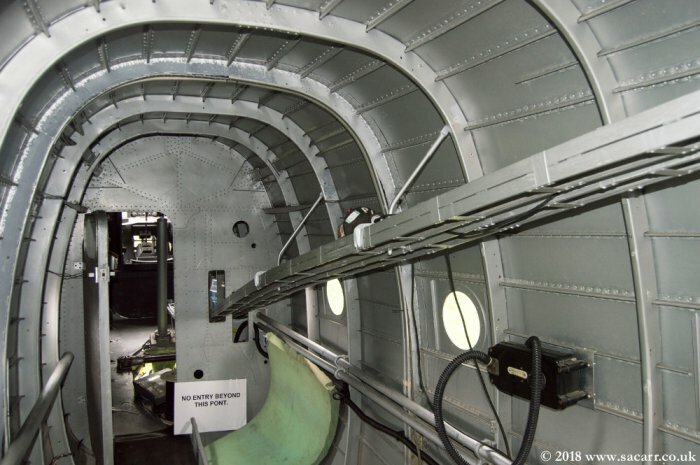 Tour complete, back down the rear fuselage towards the unusual curved crew entry door at the far right. 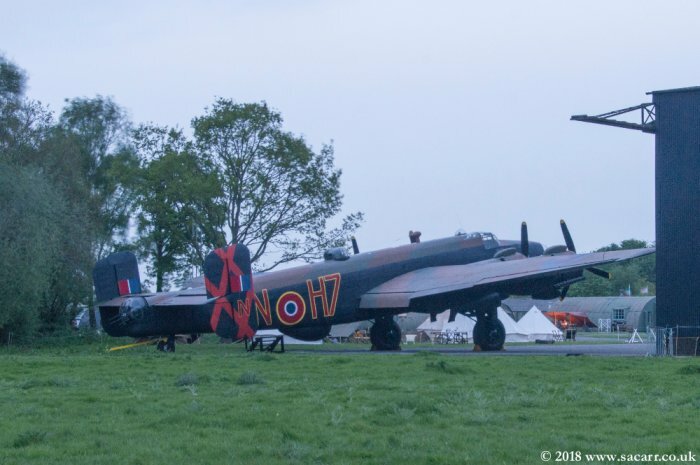 Back outside the Halifax. 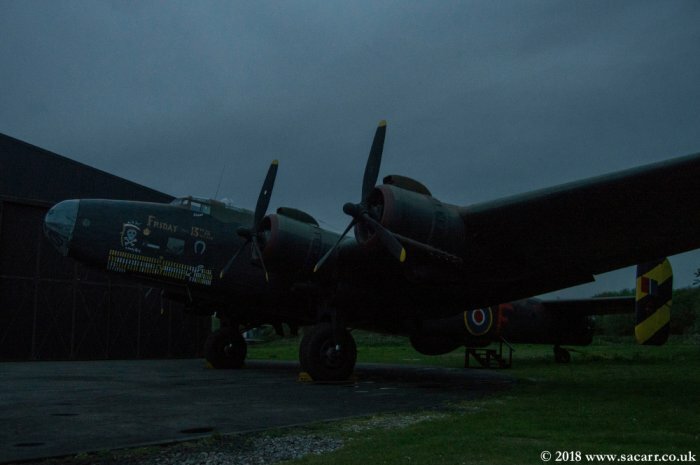 An amazing and sobering experience. 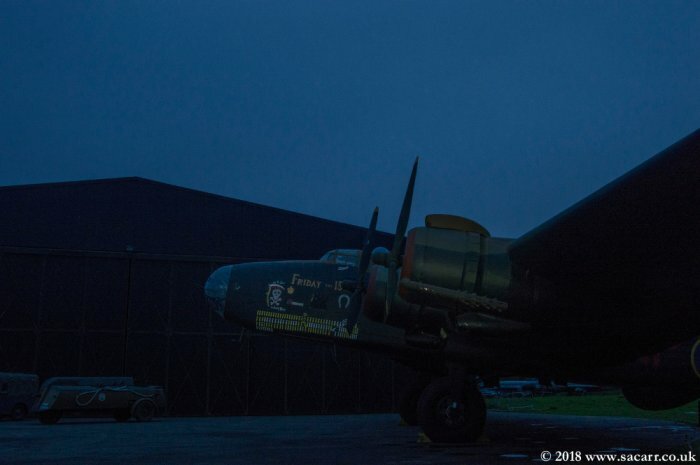 The Halifax at twilight, waiting for the mission to start. 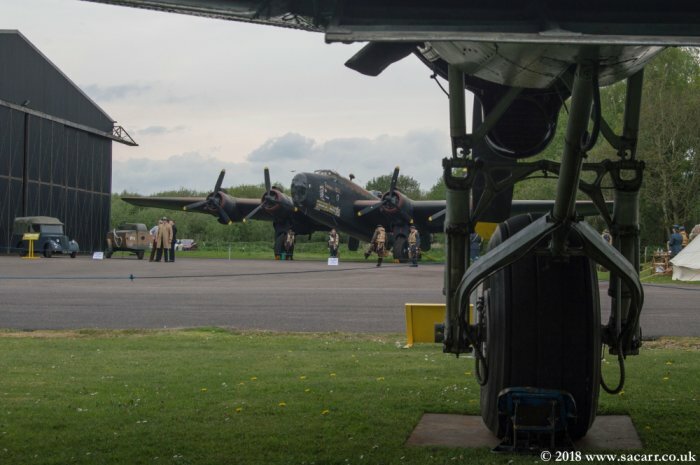 The Halifax viewed from the Dakota cockpit and from under the Dakota.